Also see restaurants I recommend vegans avoid. All these restaurants are vegan except for Fruitful Food, where vegan items are clearly labelled. As most vegan (and vegetarian) restaurants in Taiwan are run by spiritually-minded people (or cater to them) most do not serve alcohol. Restaurants do not serve alcohol unless stated otherwise, but many offer non-alcoholic beer and other beverages. Reservations are recommended. A few minutes' wtalk from Zhongxiao Dunhua Station, Exit 4. Make a U-turn as you walk out the exit, turn right immediately into Lane 170, and then take the second left (just after the post office). Flourish will be on your right. Number 32, Lane 233, Section 1, Dunhua South Rd, Da’an District, Taipei City. Ma Po Tofu is usually difficult to find vegan, let alone as healthy as this. Flourish is one of the newest and most popular vegan restaurants in Taipei. It offers a delicious range of Western, Taiwanese and Japanese-inspired dishes which are among the best value fine food in Taipei. It's also one of the few restaurants open between lunch and dinner (and until 21:00) so I recommend reserving in advance (via Facebook) or else turning up between lunch and dinner, or after about 19:00. The interior is large and crowded, and service is prompt and efficient. While the whole dining experience is very enjoyable, food is the focus, not service, decor or atmosphere. 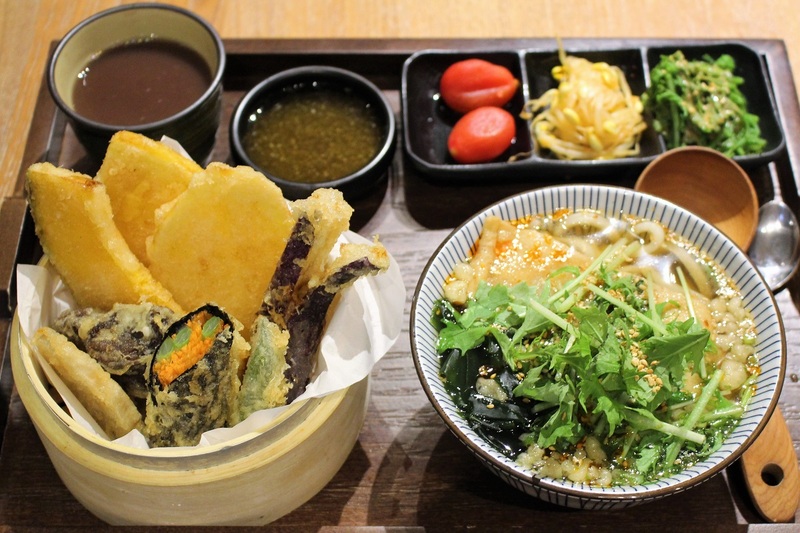 While much of the menu is Taiwanese and Western, the food and style here is most like Japanese macrobiotic food of any restaurant in Japan, so if you will be entertaining Japanese who would like a taste of home them this is the place to come. A few minutes' walk from Zhongshan Station, Exit 4. Make a U-turn as you exit the MRT, and then take the first right (into Lane 16, Section 2, Zhongshan North Road) and Hoshina will be on your left after 40 metres. Number 21, Lane 16, Section 2, Zhongshan North Road, Zhongshan District. Set meals at Hoshina are particularly good value. Originally only vegan branch of this popular chain serves the most authentic ramen (Japanese noodles) in Taipei, if not all of Taiwan, there are now a few other vegan branches, but this one is the most convenient for visitors, and it's fittingly located in Zhongshan, Taipei's most Japanese district. It also serves a few Taiwanese variants, including Ma Po Tofu, beautifully presented with Japanese simplicity. 中山北路三段26-1號Number 26-1, Section 3, Zhongshan North Road, Taipei City. Anyone who's been around Taiwan for as long as I have will remember Sophie's Garden, which when it opened about eight years ago was the first fully-vegan restaurant in Taiwan. Blosson Rena is run by the same owner, with the same great chef, but the restaurant has moved to a much more central location, and now offers the same great (and expensive) meal sets it used to, but also delicious, moderately-priced snack food, making it great for between meals. Unlike Sophie's Garden, some dishes at Blosson Rena contain onion and garlic; this change reflects the growth of the younger, non-religious vegan community in Taipei, as most of the clientele at Sophie's were Buddhist (and thus didn't eat the Buddhist five pungents). Walk straight as you exit, take your first right and it's on the right when you reach the first corner (one minute from the station). Heping East Road, Section 2, Lane 118, Number 4. Cafe / Restaurant: Open from 11:30; when the restaurant closes food is available from the bar downstairs. Ooh Cha Cha is the place to come for a quick healthy recharge. Ooh Cha Cha is one of Taipei's most famous cafes, and deservedly so, for it's been serving up simple, delicious, healthy vegan meals for years, including Taipei's best sandwiches and meal bowls. Its menu has also expanded into burgers and raw desserts. However, there's a catch with Ooh Cha Cha, which makes it disappoint a few visitors: it's what you probably get at home (if you're lucky enough to live in a vegan-friendly city), and if you're a good chef you probably can and do cook similar food yourself. Its simple, healthy meals make it a perfect go-to cafe for resident vegans looking for a healthier alternative to the usual overcooked veggies and fake meat, drowned with salty, MSG-laden sauces, and for this it deserves its fame among health-conscious, foreign residents. However, visiting vegans often find it on Happycow (usually while visiting the nearby Dictator Chiang Kai Shek Memorial Hall) and turn up expecting more than a sandwich (no matter how good the handmade sauces are). If you're in Taiwan for a short time please with limited meals to enjoy please try Taiwanese food (like the Guangfu Loving Hut), but if you want a taste of home then here's the place to come for the best Quinoa bowl in Taiwan. Ooh Cha Cha also serves vegan beer. The menu at Ooh Cha Cha Tech is slightly more international, while Hooch serves vegan pub food. Ooh Cha Cha have recently opened Ooh Cha Cha Tech, a new branch in Eastern Taipei. For most short-term visitors to Taiwan (who make up most readers of this blog) this branch is much more convenient, however the new branch includes Hooch, a bar downstairs, which is open until midnight, making it a great option for a late meal. While the bar menu is not yet finalised and is likely to be simpler and less healthy than the menu in the restaurant upstairs, the bar menu so far includes nachos and paninis. So if you need a late meal, or somewhere to while away the night playing games (available) then head to Hooch. Sun Yat Sen Memorial Hall Station, Exit 2Continue south as you exit the MRT. Cross the roundabout (circle). Take the second right (Lane 280, Guangfu South Road) and it's a few buildings down on the right. Hotpots are the Guangfu Loving Hut Staple, and the best place to enjoy this quintessential Asian dining experience in Taiwan. 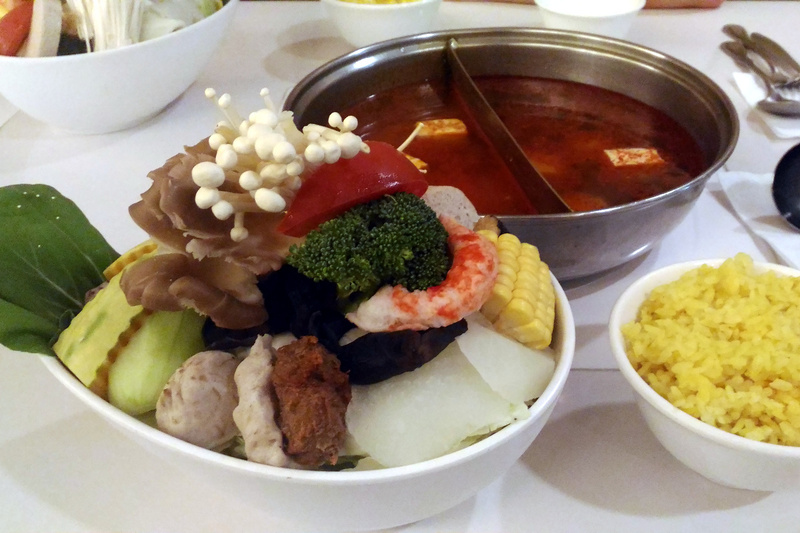 Hotpots are a popular North-East Asian cuisine in which the diner is served a plate of raw vegetables and tofu (and traditionally meat - fake meat here of course) and cooks them at their table. Most broths traditionally, of course, contain animal products, but the Guangfu Loving Hut makes its own vegan versions, and some new creations of its own. It's a good place to try Ma La (spicy) sauce, a popular flavour from SiChuan in China, and also some more Western-inspired broths. This Loving Hut is very different from most other Loving Huts, most of which serve simple "comfort food" aimed at non-vegan Taiwanese. This branch also serves a few staple fusion dishes (I recommend the Tom Yam Tahini Rice) and some rich desserts. This is the most authentic restaurant among Taipei's high-end vegan restaurants. If you can't get a table: the original branch of Veggie Creek (and the only branch not inside a shopping mall) is a short walk away, but you might not get a seat there either. 450 metres north of Daan Station, Exit 6 (not to be confused with Daan Park Station). Continue walking north for five minutes, then turn right into Lane 253 and it’s on the right in 50 metres (at the first corner). 700 metres south of Zhongxiao Fuxing Station, Exit 3. Do a U-turn after walking out the exit and then at the intersection turn left into Fuxing South Road, Section 1. Walk south for 8 minutes then turn left again into Lane 253 and it’s on the right in 50 metres (at the first corner). Taipei's best dessert - rich and filling, but raw and healthy (about NT200). Taipei's only fully-vegan raw food vegan restaurant, Plants is most famous for its desserts, but also serves sprouted grain-based dishes, hummus and other raw favourites found the world over. Raw food requires quality ingredients and is time-intensive to prepare, so it's never going to be cheap, but the price to quality ratio is much higher than the same restaurant would offer in London, New York or Melbourne. A delicious, healthy, raw meal, with a drink, main and dessert, generally costs between NT500 - 1000, expensive for a meal in Taipei but great value for what is one of the healthiest meals one can eat in Taipei. Plants also run a smaller branch (Canteen by Plants) conveniently located near Taipei Main Station. For more information please see my pages on Plants Eatery or Raw vegan restaurants in Taipei. Continue walking west as you leave the MRT. Take the fourth road on the right (Lane 217) and then the first left (not counting a tiny alley) into Alley 1 (at the 7-Eleven). The restaurant is on the right. Zhongxiao East Road, Section 3, Lane 217, Alley 1, Number 6. See Eastern Taipei Map. SoulR offers Taipei's finest vegan dining experience, serving exquisitely presented Taiwanese fusion cuisine on to a small number of tables in a comfortable (if somewhat dark), exclusive restaurant atmosphere. Specialties are pasta (with some unique flavours, including Thai and Mexican sauces), but they are most famous for their rich desserts (visit in the afternoon for their waffles). Personally I value originality of food over dining atmosphere, so if I'm going to spend several hundred NT on a meal I look for the more original fare found at the likes of Flourish or Mianto, but SoulR is undoubtedly one of Taipei's most popular vegan establishments, among residents (both Taiwanese and foreign) and among visitors to Taipei, and (like About Animals) many readers of my book report that it was their favourite in Taiwan. Price range: NT400 - NT1200+ (steak dinner set). If it's closed: Flourish and Fruitful Food are in similar price brackets, or if all else fails Veggie Creek Dunan Store is always open. Note: In late 2017 SoulR began posting photos of designer handbags, made of real leather, advertising them for sale with a vegan hashtag. 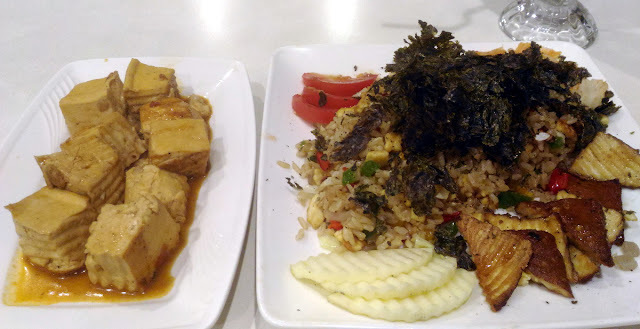 There was much confusion about why, but it appears its owners do not really understand veganism, however the consensus among Taipei vegans is that the menu here is completely vegan. Turn left as you exit, take the first left into Fuxing South Road, Section 2, walk 400 metres, then turn right into Rui An Street, and Fresh Bakery will be on your left in 120 metres. This new vegan restaurant is actually a Version 2.0 of the former Fresh bakery, Taipei's first vegan bakery which quickly became famous for its cakes and other baked delights. While a limited range of these are still on offer, it has stopped producing its breads and pastries, however that niche has now been filled by the new Hip Pun Bakery. 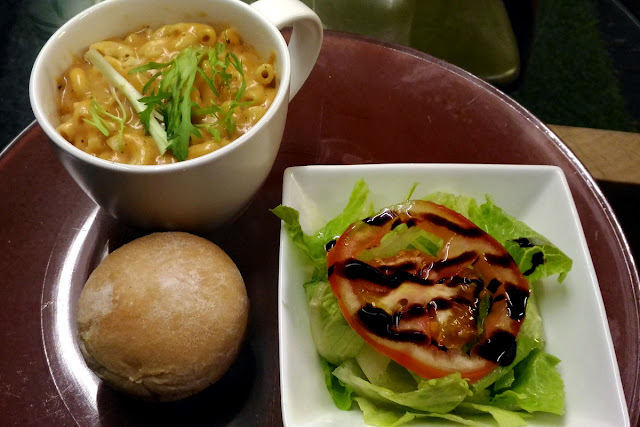 Like its former life as a bakery, Vegan Taipei aims to serve healthy, affordable vegan food to large numbers.It serves mostly Western meals, particularly pasta and pizza. It also serves some Indian curries, which (having an Indian owner / chef) are as Indian as they can possibly be without onion or garlic (to appeal to the large Buddhist community). Dishes are small but excellent quality; expect around two dishes or NT500 for a filling meal. Mianto is Taipei's boutique vegan restaurant. It serves a delicious range of healthy, authentic, vegan cuisine, and Michelle (the owner / chef) is a great host. Diners mostly eat at one large table, but there are also a few small corner tables (for two) overlooking a small park. The warm and pleasant interior also shares its space with a design company. Michelle also makes some incredible baked desserts. Food prepared individually, or for such small numbers, is inevitably more expensive than its equivalent at a large, busy restaurant, so expect to spend up to NT1000, but if you're looking for a more personal dining experience then Mianto is the place to come. If it's closed: there's not much else around here; take the Tamsui (red line) to Xiangshan Station (the final stop) for the Tian Zhuan Zhai Loving Hut (Korean, Japanese). This burger and the fries were good, but nothing (except the atmosphere) to justify the high price tag (NT$400!). Herbivore is the only vegan branch of Mia Cucina, a popular "Italian" chain which has virtually no vegan options. It's a posh restuarant inside a shopping mall in the upmarket Xinyi Distruct, a short walk from Taipei 101. If you are looking for a fine meal out in this area, then it's worth considering, but I find that like most vegan branches of non-vegan chains, the food lacks creativity, as if the management had left off the diary and egg dishes from a regular chain, much unlike when a vegan designs their own vegan menu from scratch. From Exit 3 continue walking East along the left hand side of Xinyi Road, Section 5, around a gentle turn to the left. The first major intersection is Songde Road (松德路Eastern Taipei Map. This Loving Hut lies somewhere in between the fine-dining Guangfu branch (see above) and the traditional, inexpensive Loving Huts found elsewhere in Taiwan and around the world. This branch, which is run by a multilingual Korean lady and her family, serves Korean, Japanese and Taiwanese favourites, and is often overlooked because it's a little further out than other restaurants but only a few minutes walk from Xiangshan Station (the last stop on the red line, one station after Taipei 101). I recommend this to anyone wanting to try Japanese or Korean food or a good, inexpensive meal out. If it's closed: take the red Tamsui line back to any restaurant in Eastern Taipei. 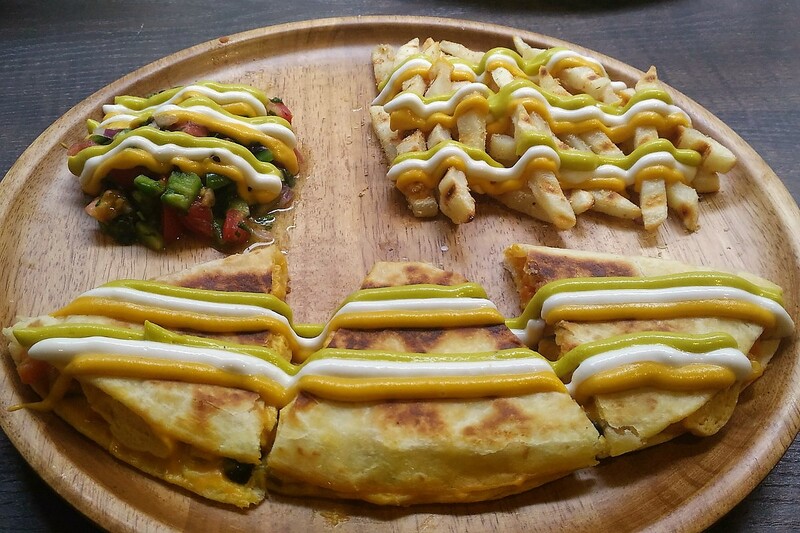 Consider a stop to pick up a bite to eat at Vegan Heaven on the way (writeup coming soon). This popular chain applies a traditional Taiwanese concept found in street food and at expensive buffets (such as Fruitful Food - see below) to a vegan store. Diners choose their own fresh vegetables, tofu and fake meats from a rack, and then the talented chef whips boils them in a traditional broth and then whips them up into a one-pot wonder in minutes. The original store, which offers the best dining experience, was started by two young (non-vegan) men after they returned to Taiwan from working holidays in Australia, and they have since opened two new stores, one in the Dunan branch of the Eslite Bookstore (famous for being open 24 hours, but the foodcourt closes around 21:00) and the Song Gao branch in the Breeze Shopping Centre, close to Taipei 101.While Veggie Creek has lost its edge since the opening of so many other vegan restaurants in eastern Taipei, it's still a unique dining opportunity and an inexpensive meal - something which makes it enormously popular with residents and visitors. If it's closed: The branches in the shopping malls shouldn't be, except on the eve of Lunar New Year and during serious typhoons. Walk out and around to the right, and take the elevator straight from the street to the 12th floor. Weekdays (preferable): Lunch: 11:30 - 15:00 (NT600), Dinner: 17:30 - 21:30 (NT700) Weekends, Holidays (must reserve ahead): Lunch: 11:30 - 14:00 (NT600), Afternoon Tea (limited menu): 14:20 - 16:20 (NT500), Dinner: 17:30 - 21:30 (NT700). 12th Floor, Mingyue Department Store, Number 200, Zhongxiao East Road. While most buffets in Taiwan are inexpensive, pay-by-weight affairs, Buddhists have for years run elaborate, all-you-can-eat buffets, offering diners dozens of dishes to choose from for NT500 to NT1000 per person. Most, unfortunately, serve a lot of dairy products and fake meats (which most Taiwanese expect when they pay a lot for a meal) and as service is minimum at most there's no way to tell what's vegan, making the whole process very frustrating for vegan diners. Fruitful Food, however, have a clear labelling system and a large array of vegan options, including (usually) Japanese and Western food, cakes and sorbet. I still, however, recommend avoiding all fake meat products, as at any non-vegan restaurant. As a popular spot for wedding feasts and other large gatherings, it's often booked out days if not weeks in advance, but it's usually possible to turn up on a weekday lunch without a reservation, which is what I recommend. Price range: NT600 (afternoon tea, with a limited buffet) - NT800 (dinner). If you can't get a seat: Flourish or the fail-safe Veggie Creek Dunan Store (inside the Eslite Bookstore, so virtually always open). Turn right into Jinzhou Street (錦州街) and it’s well signposted three hundred metres down on the right. This is as traditional, healthy and satisfying as any NT$100 meal can be. Literally 'Taiwan vegetarian', this cafe serves just that: healthy, satisfying meals based on organic vegetables, rice, tofu, and (trustworthy) fake meat - a simple, traditional Taiwanese vegetarian meal done so much better than the typical noodle houses found all over Taiwan. With meals starting around NT$100 it's no fine dining establishment, but this is about as good as healthy food on a budget gets in Taipei. It's a great option if visiting the Xingtian Temple (which doesn't allow burning ghost money, making the whole temple experience so much more pleasant than other temples in Taiwan) or the Taipei Museum of Minatures. 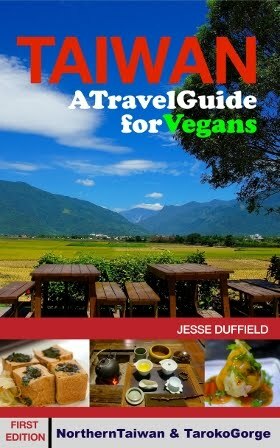 The format used here is the same system as in my guidebook, Taiwan, a Travel Guide for Vegans. It shares this same information (and more), but focuses more on sights and activities, travel practicalities (transport, safety etc), culture, history, and how to plan your trip around weather, crowds and opening hours - basically just just like any other guidebook, except that it is all written from a vegan perspective. It better resembles conventional travel guides (eg Lonely Planet, Rough Guide) than most "vegan guides" (which focus just on food), however of course my guidebook only recommends vegan-friendly restaurants and animal- and earth-friendly entertainment and activities. Peta has come out with its "Most Vegan-Friendly Cities in Asia list, and Taipei is at the top." When I first arrived in Taiwan ten years ago there were NO vegan restaurants (and not many good vegetarian restaurants either), and it's been immensely rewarding to see so many new restaurants arrive on the scene, and transform Taipei from somewhere that a good meal started in the kitchen to one in which vegans are spoiled for choice, especially given how affordable food is here. Ooh Cha Cha deservedly gets the first mention. Taipei's place at the top features in today's Taipei Times (Jan 14th). Finding great vegan food in Taipei (and most other Taiwanese cities) is certainly easy, both for residents and visitors alike, and it's wonderful to have so much choice: from Taipei Main Station it's a short walk or subway ride to reach Taiwanese, Chinese, Japanese or Western foods, from restaurants spanning the continuim from from botique, fine-dining establishments (so much less expensive than restaurants in other veg capitals) to night markets, and everything in between. Taipei is a vegan foodie heaven. While this list was for cities, it's also worth mentioning that with such universal respect for vegetarianism (and increasingly for veganism, as the vegan population continues to grow exponentially) Taiwan is arguably the most vegan-friendly country in Asia, if not in the world. Even convenience stores sell vegan items, and it's easy to find them thanks to the world's most comprehensive vegetarian food labelling system. Vegan quesadilla from Tofunia, one of Taipei's newest and best vegan establishments. However, I have a confession to make: I disagree with Peta's findings. Taiwan is the vegan heart of Asia, but when it comes to cities, Kyoto takes the macrobiotic cake and the shojin ryori (Buddhist Japanese vegan cuisine) as the vegan capital of Asia. Being vegan in Japan is incredibly difficult, with virtually no understanding of even vegetarianism among the population, and few vegan restaurants outside the main centres or even snack foods at convenience stores. I suspect that it didn't even occur to the researchers to consider Japan for this list, and it's not hard to see why. However I've noticed a trend over the years: with a few notable exceptions, particularly the Tokyo Loving Hut and Ain Soph, most new vegan restaurants I have seen arrive on the scene in Japan have either closed their doors or moved to Kyoto, where the never-ending stream of tourists keeps them in business. While this is unfortunate for the rest of Japan, and I really wish some woulde move to other cities, this makes Kyoto, in my opinion, the most vegan-friendly restaurant in Asia. I have a list of some of the restaurants there on my Vegan Restaurants in Kyoto page.